You have added Midnight Miss Embellished Navy Party Dress into shopping cart. FINAL SALE. This would make a cute dress to wear to any upcoming party, dance, or event! The Midnight Miss Embellished Navy Party Dress is fully lined. It has a strapless sweetheart neckline and lightly padded bust for support. It has detachable and adjustable spaghetti straps. The top is made of pintuck fabric, adding texture to this look. The attached skirt has a flowy waterfall cut and a layer of invisible tulle underneath adds a bit of volume. Bold clear rhinestone embellishments decorate the waist of this dress, adding a touch of sparkle! The back of this dress features an open back with a band of fabric with hook and eye closures. A hidden back zipper completes this look. The Midnight Miss Embellished Navy Party Dress is perfect for any cocktail party, dance, or event. Pair it with strappy metallic heels or pumps for an unforgettable look. You have added Midnight Miss Embellished Navy Party Dress into Wishlist. You have added Midnight Miss Embellished Navy Party Dress for Stock Notification. 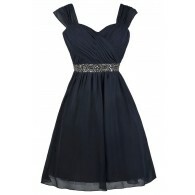 You have set Midnight Miss Embellished Navy Party Dress as a loved product. You have removed Midnight Miss Embellished Navy Party Dress as a loved product.